PM Shinzo Abe appeared on the popular variety TV show ‘VS Arashi’ (VS嵐) yesterday after attempting to explain the government’s new security bills on the Fuji Network’s ‘Everyone’s News’ (みんなのニュース) program. The Japanese Prime Minister made the rare TV appearances in an effort to persuade the public of the advantages of war and reverse dropping approval ratings. 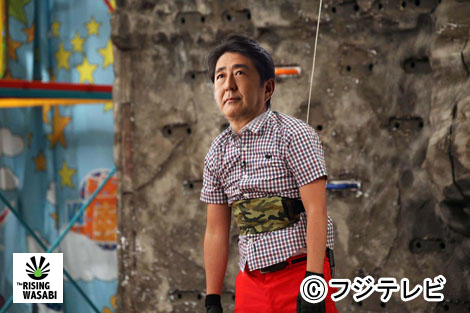 However, his performance on VS Arashi backfired during the Cliff Climb game, with the Prime Minister ignoring advice from the crowd and falling suddenly back to Earth. Many political commentators have said the rare television appearance has only served to reveal the Prime Minister’s desperation. “PM Abe was trying to explain the intricacies of changing the pacifist constitution to allow Japan to enter war while playing games with Arashi leader Satoshi Ono. Ono didn’t talk much as usual, but when he did speak the Prime Minister was only focused on his own agenda. The Prime Minister even made Masaki Aiba look smart,” one Japanese political commentator explained. The governing LDP (Liberal Democratic Party) has announced that PM Abe will turn to competitive game shows to improve public support and begin training for next year’s Ninja Warrior TV series ‘SASUKE2016’.